I love old, obscure, often overlooked records that you would find in thrift stores. I have a pretty good sized collection of cheesy artifacts from the 1950's through 1970's that I've picked up over the years. I especially enjoy the cover art. In most cases, it is the best part of the record. Highly imaginative and most of the time misleading as to the quality of the record. The music in most cases never holds up to the promises of the artwork, but that is ok. Many of these record covers are suitable for framing...to enjoy as fine art if you will. 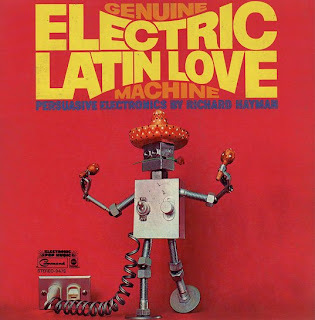 Here's one of my favorite pieces of vinyl art...Richard Hayman's "Genuine Electric Latin Love Machine". 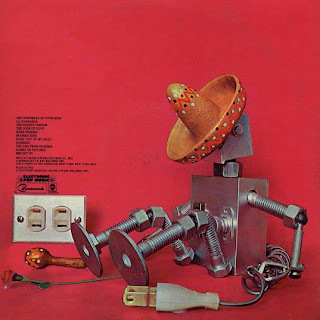 This record features a beautiful gate fold cover, with the robot starting out as cheerful and electrified, and slowly digressing to despondent and unplugged. Here is the front and back of the album. As for the music, it's your typical mediocre LSD drenched late 1960's elevator music. Sounds like a great concept, but it's really not. Coming tonight, as promised late last week, is a review of Faith No More's "Angel Dust", followed on Sunday by John Ford's "The Searchers", so don't touch that dial.